Welcome to my brand new site, Payment Free Life. Some of you might have found this site because you were looking for KlingToCash. For some of you, this is your first visit. Hopefully, the first of many. 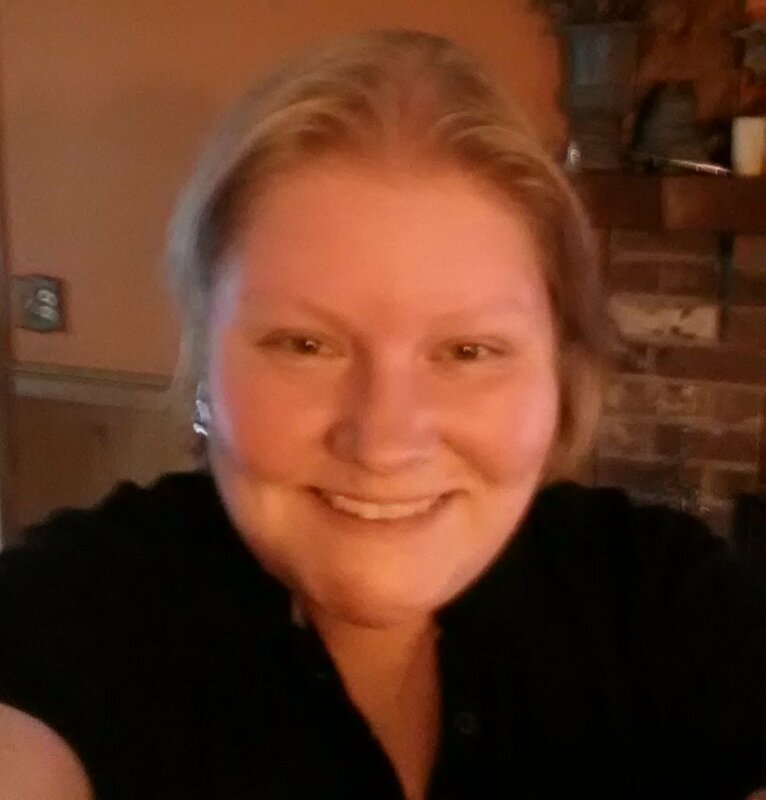 A few weeks ago, I was pondering the direction to take my blog. I’ve been writing for five years about saving money, budgeting and getting out of debt. I wanted my site to reflect our goals and the goals of so many I’ve spoken with over the past few years. When I sat down to think of our journey and our goals, the overarching theme is to achieve a payment free life. Our goal is pay off our debt, save money and live our dreams. Now, I share that dream with you. Imaging what your life would be like if you had no payments. How would your life change? What could you accomplish? Please take some time to explore the new site. All the content from the last five years is here. You can browse by category by using the links at the top of the site. If you like what you read, I encourage you to sign up for our email updates in the side bar. We will never share your information with others. I also welcome and encourage your feedback. My husband and I built this site for you, to use our story to encourage your journey. Thank you for sharing our journey. Please let me know how I can help you on yours. Are you making these budget mistakes? Do you ever feel like you don’t know where you money is going? A budget can help you do that. The first time you make a budget, it’ll take you about an hour. Now my budget takes me about 10 minutes. Most things don’t change month-to-month so there is very little that changes each month. Once you work out the kinks, creating a new budget is pretty quick. Is financial security worth an hour a month? You could do your budget while watching TV. When you make a budget and stick it in a drawer, you might as well not make one at all. You just wasted 10 minutes of your life. Managing your budget doesn’t have to take long. I spend about 15 minutes per week updating my check register and paying bills that are not set up automatically. I have a spreadsheet set up in Google spreadsheets that I use as my check register so I can access it from anywhere. It’s extremely difficult to stay on budget if you don’t have a goal. Set a goal. It could get getting out of debt, saving an emergency fund, saving for retirement, saving for a car or a vacation. Whatever your goal is, get it down on paper. Put it on your wall. Keep that goal in the front of your mind. It makes it so much easier to stick to a plan. When we got married, the official said, “And now you are one.” We went from “his” and “hers” to “ours”. We made decisions together. If you can’t share common dreams and goals, how can you develop a plan to get there? Don’t start with the budget. Start by discussing what you want your life to look like. Once you agree on that, it’s easier to develop a plan to get there, together. I see this all too often and it frustrates the crap out of me: people who are saving for retirement or purchasing company stock but can’t pay their bills. The argument I always get is “well I’ll need money for retirement!” You bet your life you will because you are going to need it to pay off all that debt you are accumulating today! If you take a few years off from retirement saving to get your mess cleaned up, you’ll easily be able to put 15% of your income into retirement each year. You’ll free up cash flow and end up with more money in the end. Don’t cut off your nose to spite your face! 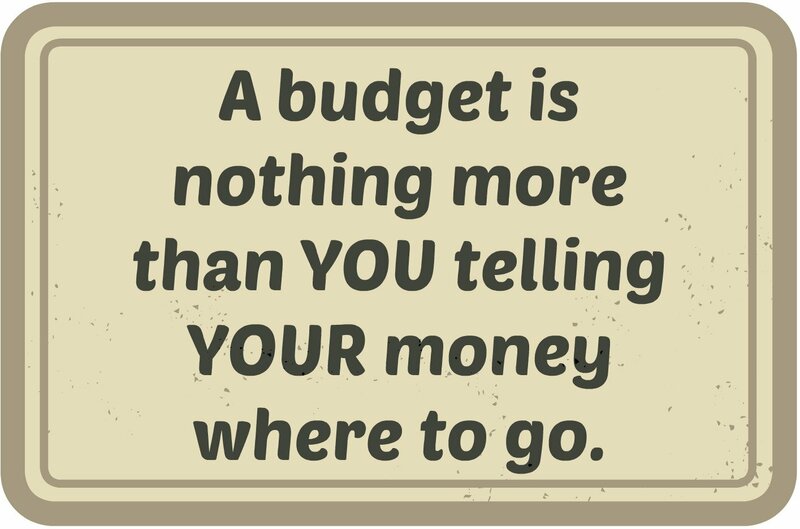 This is often the one that kills budgeting for most people. 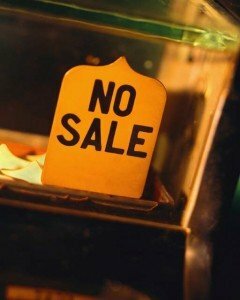 The reason that people think budgets are restrictive, terrible, horrible, no good, very bad things is because they make their budgets that way. How do I know that? Because my husband and I did that when we first started. Our budget was so tight, after a few months we completely fell off the deep end and bought anything we could get our hands on. I’m talking stupid with zeros on it. Budget yourself some BLOW money. Remember that you make this budget. You can put what you want in it. Don’t build it the way I think you should or the way someone else thinks you should. You need to build your budget the you can live with it. The first goal is to track your money. I mentioned goals earlier. Some people have lots of goals. Saving for retirement while trying to get out of debt and save for a new car, while also trying to buy a house will get you nowhere. Pick a goal. Stick with that goal until you accomplish it, then pick the next goal. Rinse, repeat as needed. When we first started budgeting, we thought we could make one budget and then reuse it every month. That did not work. Things change. Life changes. Budgets should to. I start with the previous budget and update it for the current month. 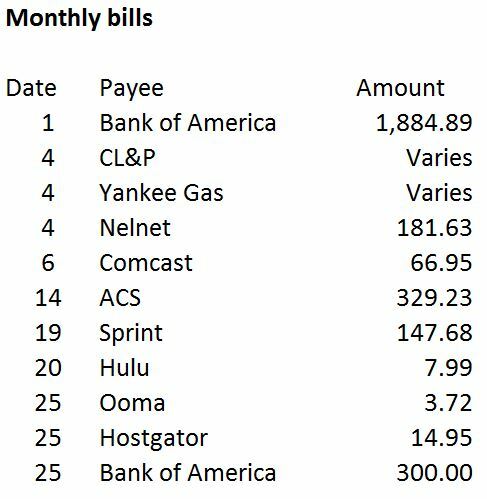 I add in the actual utilities for the month and add any items that might come up in that particular month, like the quarterly water bill or semiannual auto insurance payments. There are also things like weddings, showers and birthdays that might need to be added to the budget. Budgets are also flexible. If something happens during the month, sit down with your budget and adjust it. Decide where the extra money will come from. Remember, this is YOUR budget. 9. Believing that the only way to work your budget is to decrease spending. Jeff and I have cut our budget a lot. We don’t have cable TV. We keep the heat down. If I cut the grocery budget anymore, Jeff’s going to start an anti-vegetarian protest. We realized that if we want to pay things off faster, we needed to increase our income. We both have side businesses that bring in extra money. Think about what you can do to make some extra cash. Walk dogs, mow lawns, shovel snow, do repairs for folks. Think about the skills you have and see how you can apply them to make extra cash. When I asked readers the first word or phrase that came to mind when they heard the word “budget”, many people responded with various forms of hopelessness. I remember that feeling. I remember thinking we could never get out of debt. I remember thinking we would be broke forever. I remember thinking that payments were normal and someday they would just go away, that credit cards were a way of life. I also remember how it felt when we built our thousand dollar emergency fund. It was like a 2-ton weight had been lifted. We made a lot less money then and that was a huge accomplishment. Then we paid off the first credit card. It wasn’t huge but that little win helped propel us to where we are today. Will it be easy? Probably not. But when the stress of payments is stronger than your desire for stuff, you can get there. We still have a long way to go in our debt-free journey and it’s not always easy, but we have so much more peace now. The financial stress is gone. We have a plan and we live by it. What mistakes did I miss? Add your own in the comments. I’ve been writing this blog for over five years and this project has become about more than just my journey. It is about our journey. Yours and mine. We are all in different places in our lives financially, but we share one common goal. To get to a better place. With that in mind, I have created a reader survey. It is a quick, five minute survey about personal finance. I do not ask for your name or email address, so the survey is completely anonymous. I’m just trying to develop a feel for who is reading the blog and what your concerns are. I hope you’ll take a moment to take the survey and I appreciate your time. Take control of your spending! There appears to be a stigma about budgets. It has become a dirty word to many. People tell me budgets are restrictive. They can’t do what they want if they have a budget. A budget is limiting. It is controlling. Who would make your budget? Your mom? The mailman? The guy next door? Since you make your budget, you can put whatever you want into it. Want to go on vacation? You can budget for that too! The only limitation on your budget is your income. Now for some people that might be a problem. For the vast majority of people I council, they make enough money to pay all their bills and there is money left over. It’s time to take control of your spending! Where did all my money go last month? Have you ever asked yourself that question? 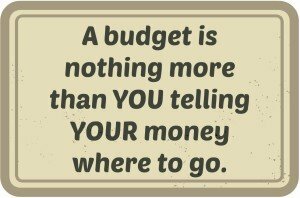 Those of us on a budget never need to ask that question because we made a spending plan before the money went out the door and tracked our spending during the month to ensure we stayed within budget. Can you budget for fun things? Absolutely, just make sure your budget aligns with your goals. If you read the blog, you know our goal is to get out of debt. But that is really just part of a bigger goal. My husband would like to transition out of his full-time job at 55 and focus on his passion. In order to do this, we need to pay off our debt so we can ramp up our retirement savings. We have chosen to make this a priority so we made the decision to cut back on other things. Do we still budget for some fun stuff? Of course, but that budget is very small compared to our total income. We each get $50 per month for blow money (some people call it mad money). We can spend this on whatever we want. We also budget $100 per month for entertainment. This two items combined represent about 2.5% of our total budget. Typically, we don’t even spend it all, but it gives us breathing room to have a bit of fun while we are on this journey to become debt free. It also doesn’t stop us from achieving our goal. Currently about 50% of our take home pay goes toward our debt snowball. What are your goals? Does your spending reflect those goals? If not, a budget could help you get there. 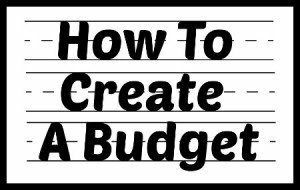 You can read more about how to construct a budget here. Just remember that a budget is just a spending plan. You design it. You control where your money goes. Since we use a 28-day budget, we made a budget every 4 weeks. Our next budget starts on March 19th and will run through April 15. If you have never done a budget, or a 28-day budget, start your budget when you get your next pay check. To create the budget, you’ll need a piece of paper or a spreadsheet. Either works fine. I like a spreadsheet because you can copy the worksheet so you don’t need to start from scratch and you can keep a history. It will also automatically calculate how much money is left over as you create the budget. The goal is to spend every dollar on paper before the month begins. Should you budget for this? When we first started budgeting, we were unsure if we should budget every month for things like clothing, our semiannual car insurance or even things like Christmas. At first, we did. We were building up funds for lots of irregular expenses. Each month we would put away a small amount for clothing, one-sixth of the car insurance and one-twelfth of the Christmas budget, plus money for a bunch of other things, like car maintenance and car taxes. As this money was building up, it bothered me. Here was all this money sitting there in a savings account making nothing, while we were paying interest on our debt. At the time, our car taxes were about $100 a year. Car insurance was $300 every six months. The Christmas budget was $400. None of these items were going to break the bank. We could easily cash flow these things in the month the bill came due or the event happened. I stopped putting money aside for them and used the money toward the debt. How do I decide what to budget for monthly? If I can pay the amount in full in the month I need to, I don’t budget for it monthly. 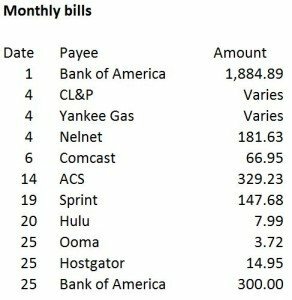 We could pay any of our regular bills that come due without setting money aside each month. Even when we had to replace the transmission on one of the cars, we cash flowed it. My snowball took a hit that month but we were still able to pay all of our bills, put some money toward extra snowball payments and not touch the emergency fund. Replacing the transmission was an emergency and we could have used that fund, but we didn’t need to. If a bill is so large I can’t budget for it in a single month, I budget for it monthly. If we had to pay our house taxes in a lump sum rather than paying into escrow, that is something we would need to budget for monthly. We could not afford that payment in July (in our town house taxes are paid annually). Look at the things you pay for on a quarterly, semiannually or annual basis. Could you afford to make that payment in full out of your monthly budget and still pay all your bills and buy gas and groceries? If the answer is no, you need to put money aside monthly for it. If you could pay for it, then you don’t need to put the money aside. Some people like creating sinking funds or funds for larger irregular bills even if they have the money to pay them out of the monthly budget. If you want to do that, that is fine. Just consider how much you are paying in interest while the money sits there. Could you knock out another debt and free up more cash because you don’t have the monthly payment anymore? The other thing I realized is that if I put money aside for clothes, I’m going to buy clothes. If I put money aside for home repairs, I will find something home related to spend it on (not necessarily repairs either). Stay intense and get yourself out of debt. Think of that you could do without any debt! Budgeting is not a perfect science. Life happens. This month, we had a few budget issues.